To the provision of high quality, affordable, safe and accessible pathology service to all Australians. Provide a majority of all community-based pathology services in Australia. For private pathology in Australia. Australian Pathology is the national peak body for private pathology in Australia. Our members include both small specialised laboratories as well as large organisations with laboratories nationwide, representing more than 95% of the industry’s pathology services in Australia. 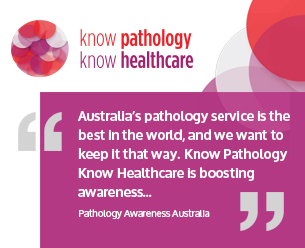 Australian Pathology members are committed to the provision of high quality, affordable, safe and accessible pathology service to all Australians. Australian Pathology members provide a large majority of all community-based pathology services in Australia. View the latest publications, policies and papers. Pathology is the branch of medicine which is involved in understanding the causes and processes of disease. It does this by looking at changes in the tissues of the body, blood and other body fluids. Some of these changes show the causes of disease while others show how severe a condition is and can be used to monitor the progress of treatments. Pathologists are specialist medical practitioners working in the field of pathology. Their role is to carry out tests on various tissues including blood, body fluids and samples of tissue taken during surgery or in another setting, such as a pathology collection centre, on the request of a doctor. These samples are then examined in order to understand what is causing an illness or to monitor treatments. Whilst Pathologists often do not communicate directly with patients, they provide the results of tests and their interpretations to the referring Medical Practitioners and Specialists who provide clinical care to patients. Pathologists therefore act as consultants to other Medical Practitioners and Specialists and play a vital role in the Medical Team providing care to patients including the diagnosis and treatment of diseases. Sometimes Pathologists are directly involved in the clinical care of patients as the Clinician in charge or in conjunction with other Medical Specialists, General Practitioners and other Health Care Providers. Pathology testing also plays an essential part in screening and disease prevention programs which promote the overall health and wellbeing of our community. These programs range from testing new born babies for genetic conditions which can be treated successfully, if identified early, to the detection of precancerous conditions, such as Pap smear screening, which, in Australia, has resulted in the reduction of the incidence of cancer of the cervix by more than 50%. By reducing the impact of preventable and treatable diseases in the community, the pathology sector is helping to create a healthier future for all Australians.